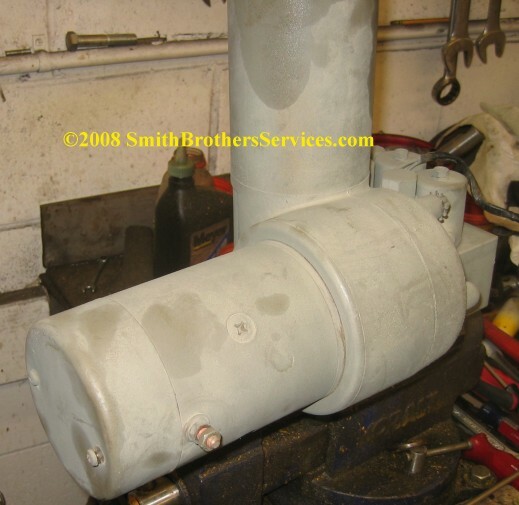 Smith Brothers Services, LLC - Blog - January 2009 - Meyer plow pump repairs and rebuilds. 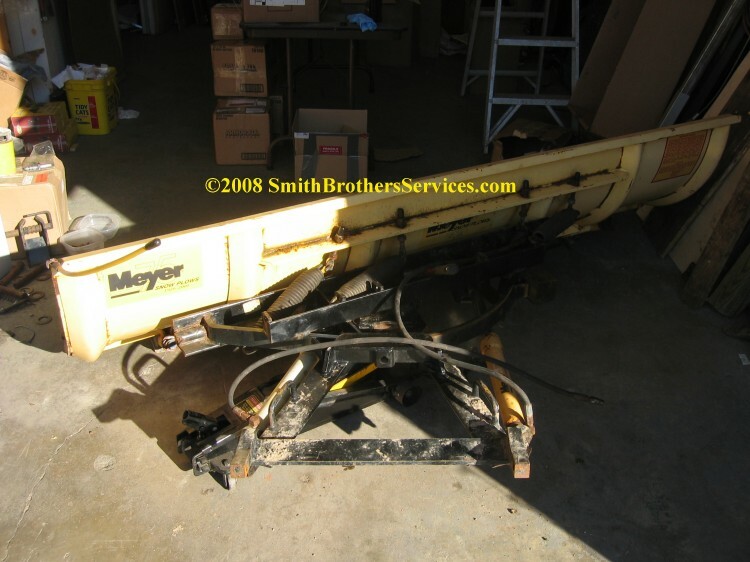 Meyer C-8 plow in for repair. Trip Pivot Pins snapped. Mentioned to customer they have grease fittings on them, he said his don't. 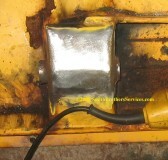 Customer was plowing a dirt construction site when pins snapped. 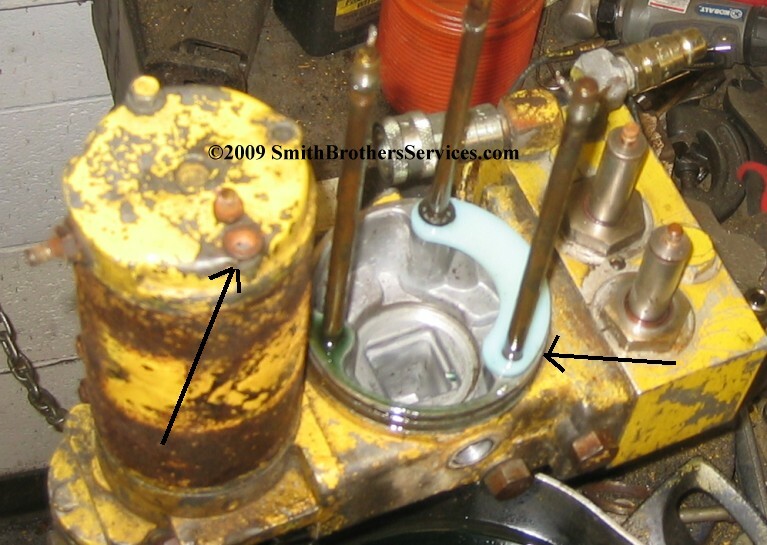 Arrow pointing at hollow center of Trip Pivot Pin. 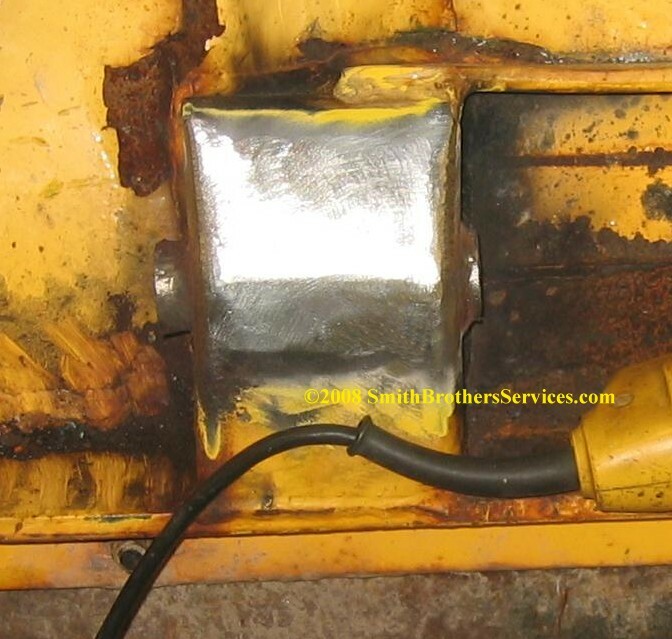 They DID HAVE GREASE FITTINGS on them. Half of Trip Pivot Pin snapped off in Meyer C-8 Moldboard. We had to cut a piece of the box out to gain access to the sleeve to heat it up. Once hot the half pin was driven out with a punch and baby sledge. 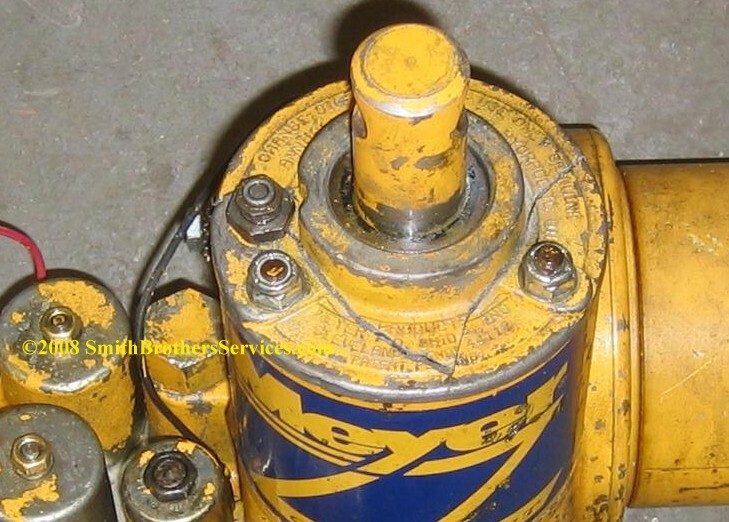 Meyer E-60 plow pump. 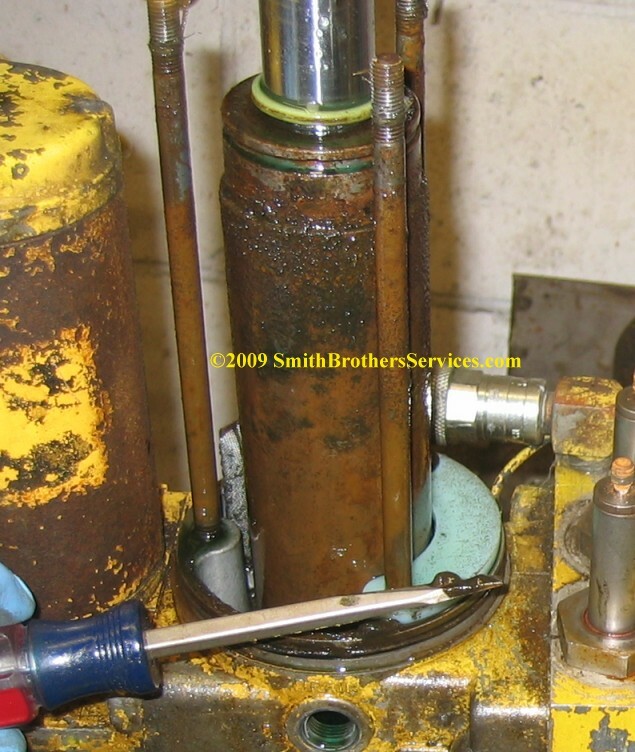 Customer decided to increase pump pressure with no pressure gauge, and no experience. Pressure adjusted too high, top cap cracked on first lift. 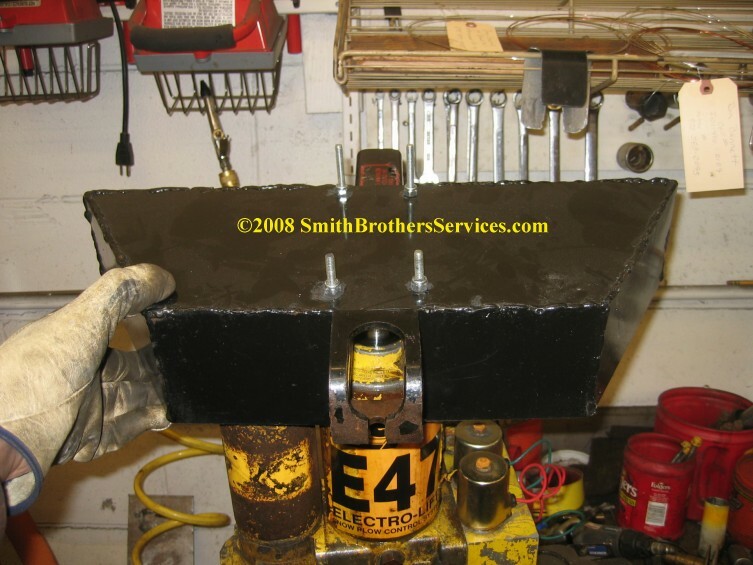 Here it is with the piece welded back in place and ground smooth. Got the half of pivot pin out of Meyer C-8 plow Sector. Heated it up, and drove it out. 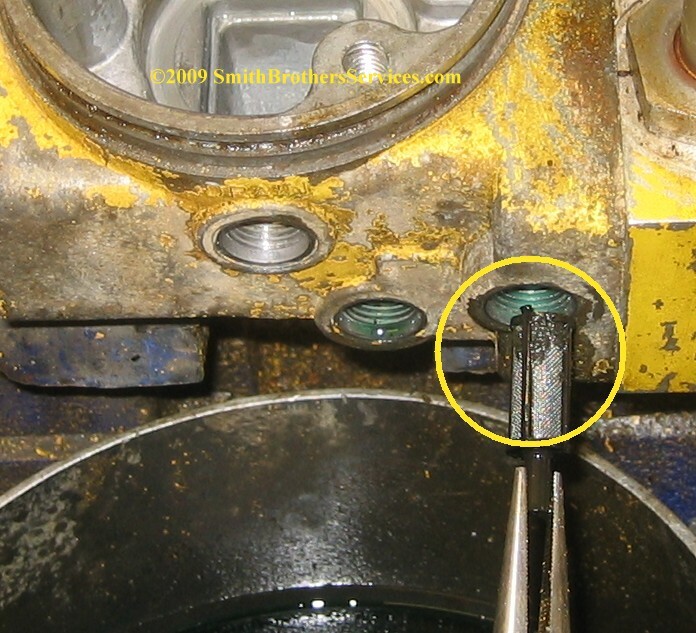 New Trip Pivot Pin with grease fitting. 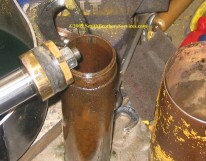 We weld the holes that will feed the sleeve on the sector closed and grind the weld smooth. We install a grease fitting on the Sleeve itself instead. 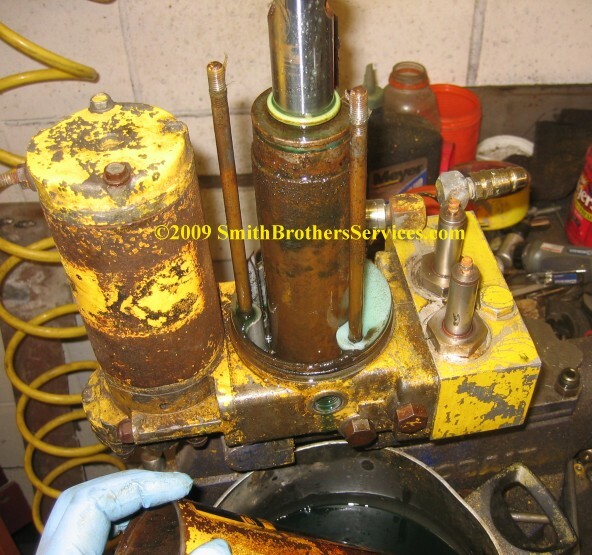 Hmmm, this Meyer E-47 unit might have a little water mixed in with the oil..... More like A LOT of water! 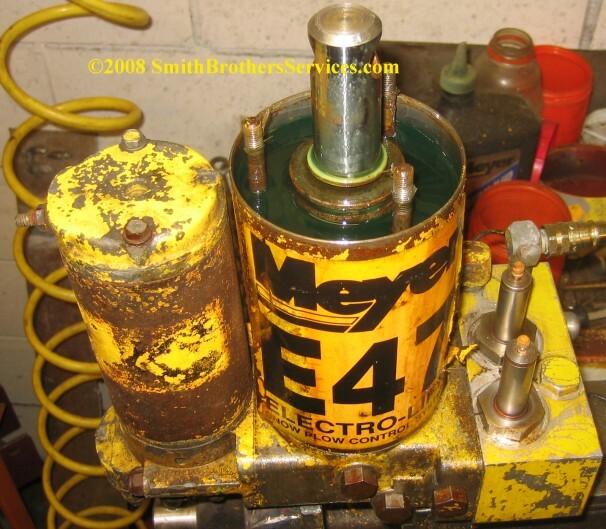 Meyer E-60H in for service. We decided to do rebuild. Got half the motor off. 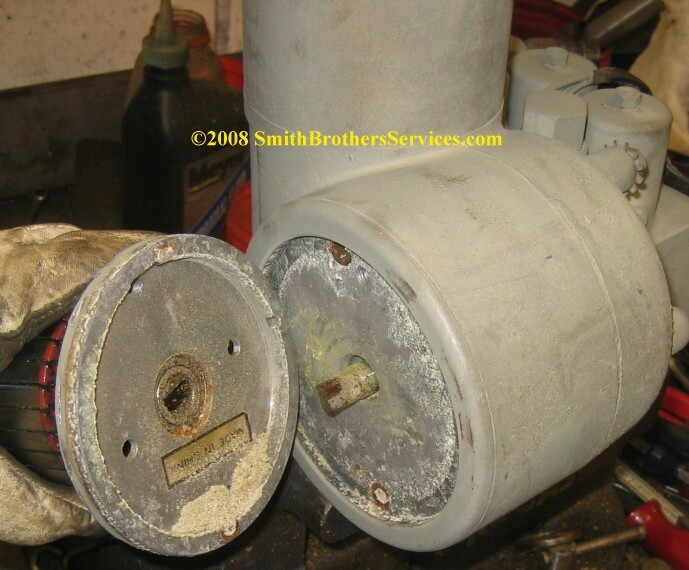 The Meyer E-60 Motor Base Plate is fused to the E-60 Sump Base with corrosion. Got it off with a chisel. You can see the decal on the base plate, it is upside down, but reads MADE IN CHINA. 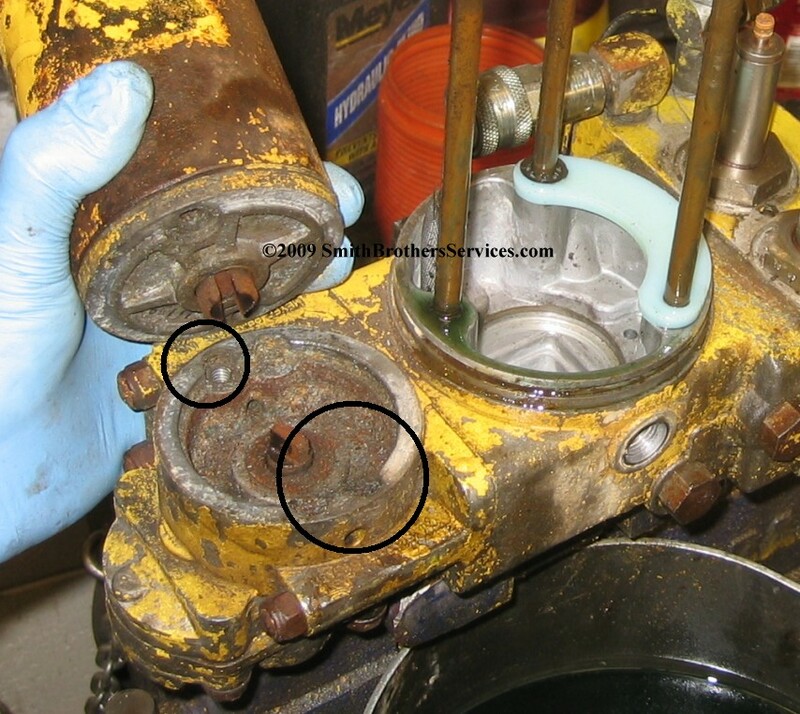 Look at the white corrosion. 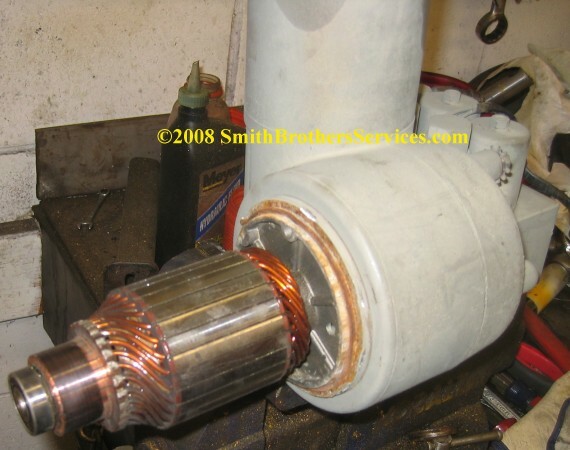 This is the original single lug motor. It was made in China for Fenner. 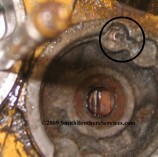 Again, this is what didn't come out with the drain plug removed! This is a shame. 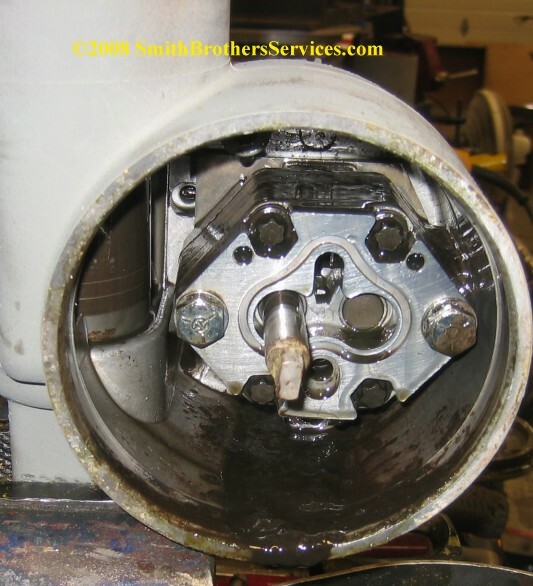 Customer stated he brought this Meyer E-47 plow pump (below) to another dealer for a rebuild "a few weeks ago and it was $600". I'd be pissed if I were him! Custom made cover (made by customer) to try and keep snow off the unit, and water out of the unit. It is steel and held on with J bolts. So far, not good. 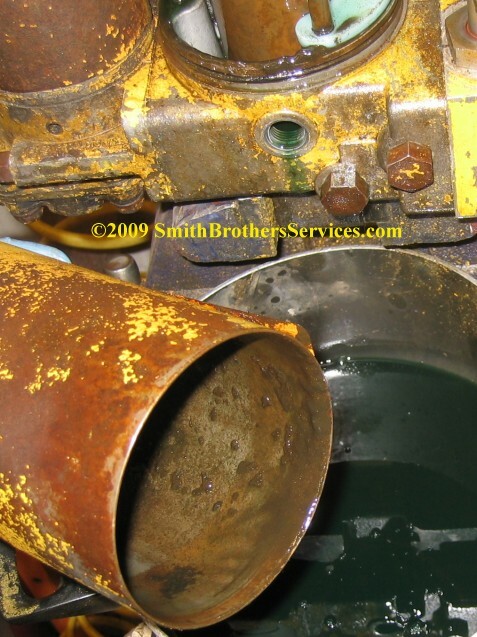 Can see some rust in the can here, and green oil? Strange. 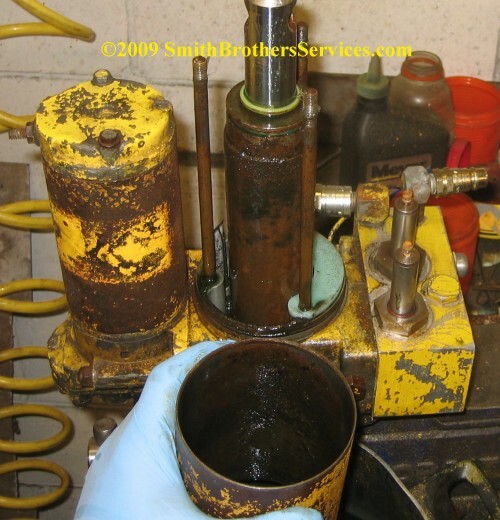 Must be just plain hydraulic oil. Now MUCH more rust is visible. You can see the rust in the can. No way was it off "a few weeks ago". 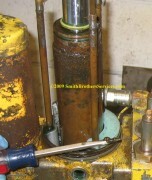 Look at the rust on the Lift Cylinder! Unbelievable! So much rust in "a few weeks". 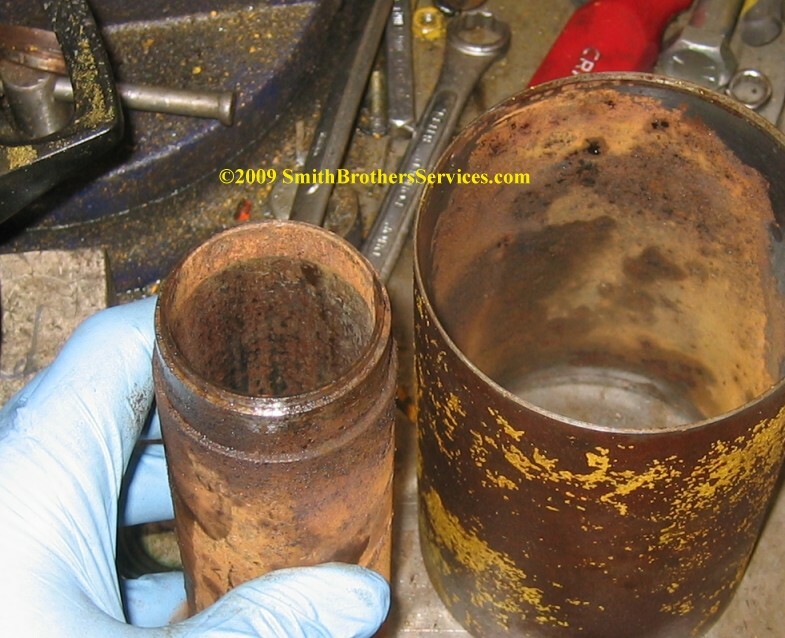 Look at the gunk accumulated on the lip of the Meyer E-47 Sump Base. Lift Ram Packing Cup has threads showing. Look at the rust in the Lift Cylinder bore! 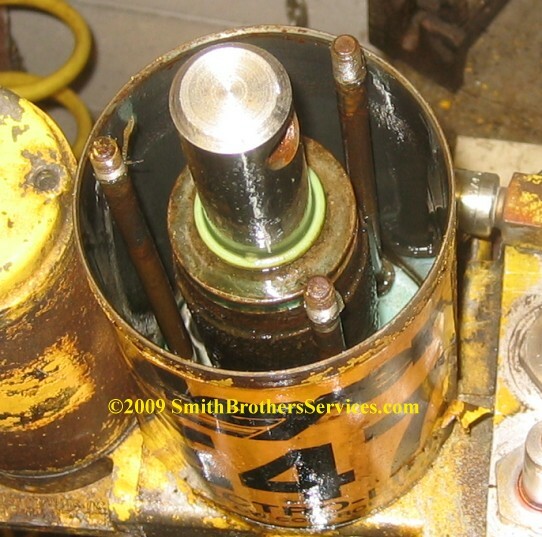 Lift Cylinder is junk. It will be replaced. 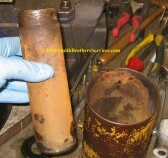 Look at the pits and rust on the Lift Cylinder bore! Arrow pointing to missing Baffle Retaining Washer. 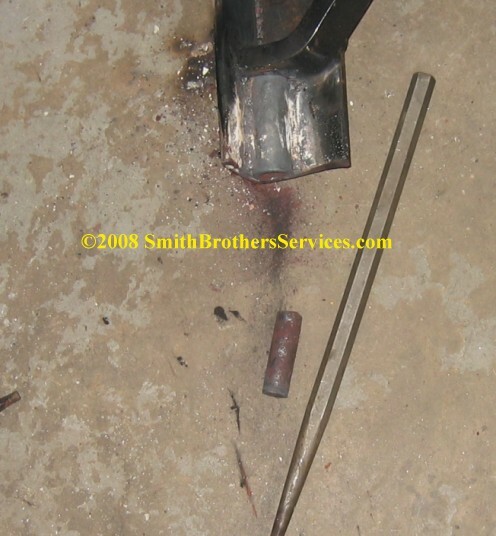 Went to remove the motor and this piece of bolt just came out. The arrow is pointing to the hole. 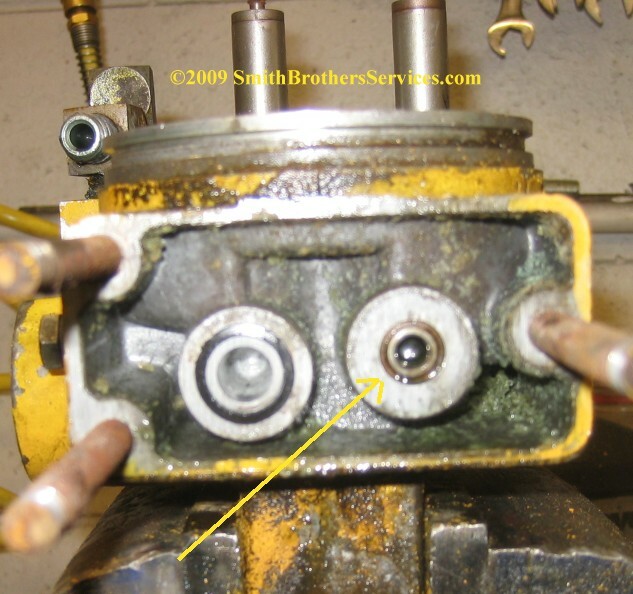 The bolt head is just above the hole in the pic. 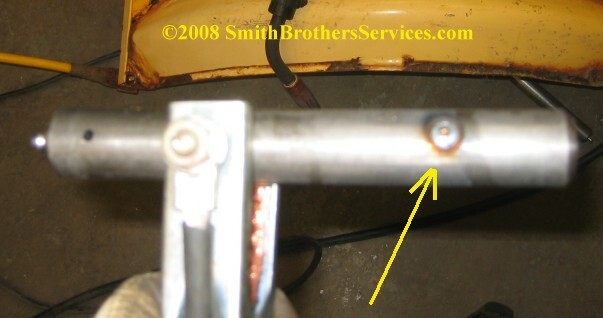 The stub end of the bolt was rusty. 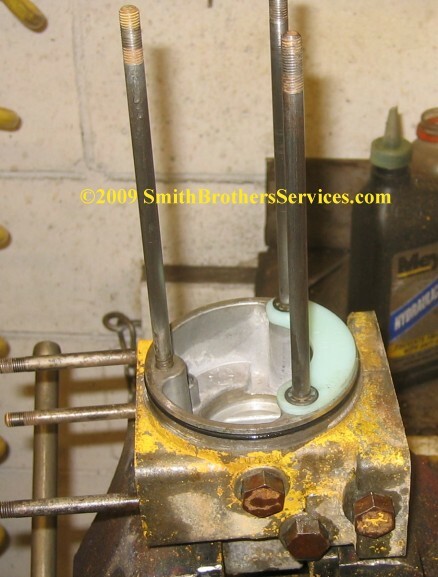 Removed the back motor bolt, and tipped the motor back. 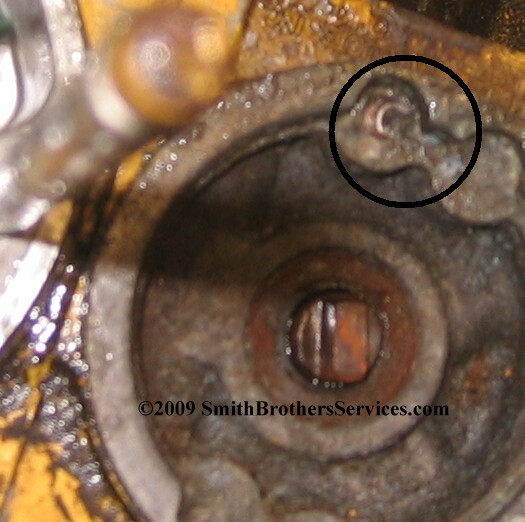 You can see the threads in the pump for the back bolt. The front ones look rusty because the piece of broken bolt is still in the hole in the pump. 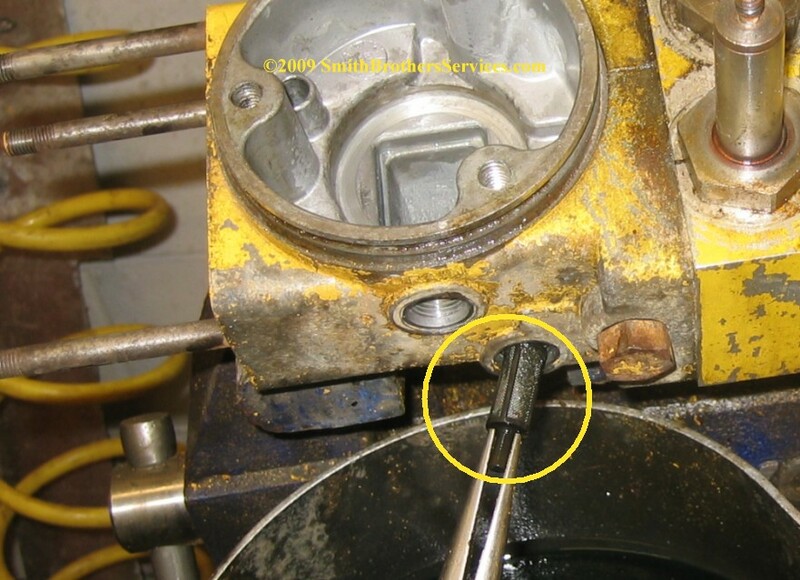 Here you can see an attempt was made to drill out the broken bolt. Unfortunately is was off center, and the threads were drilled out instead. We will drill and tap new threads. 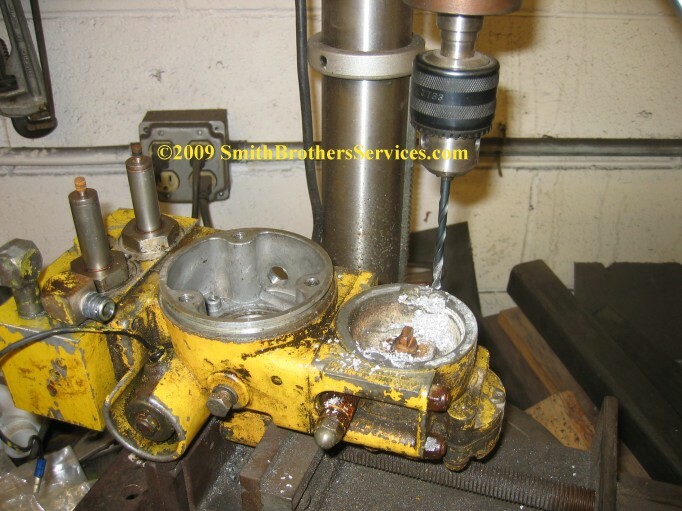 Drilling new hole to tap. 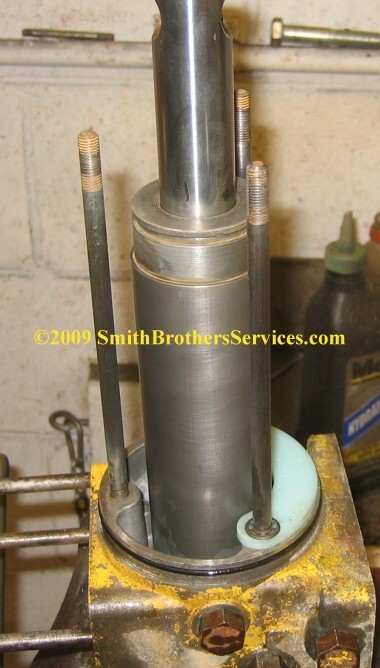 High pressure port Filter. 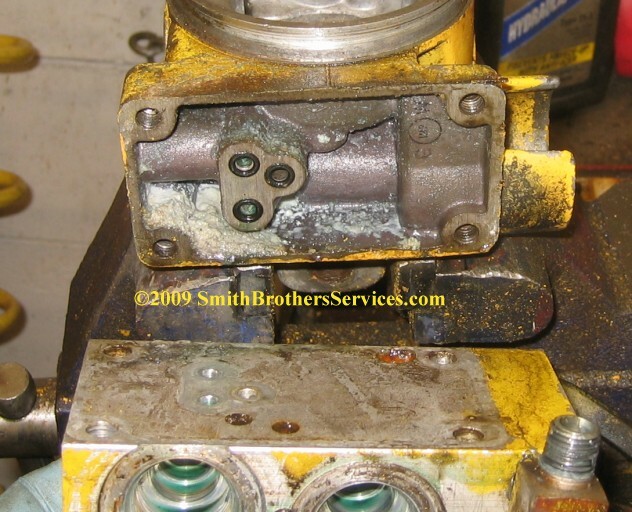 Power Angle Block removed. 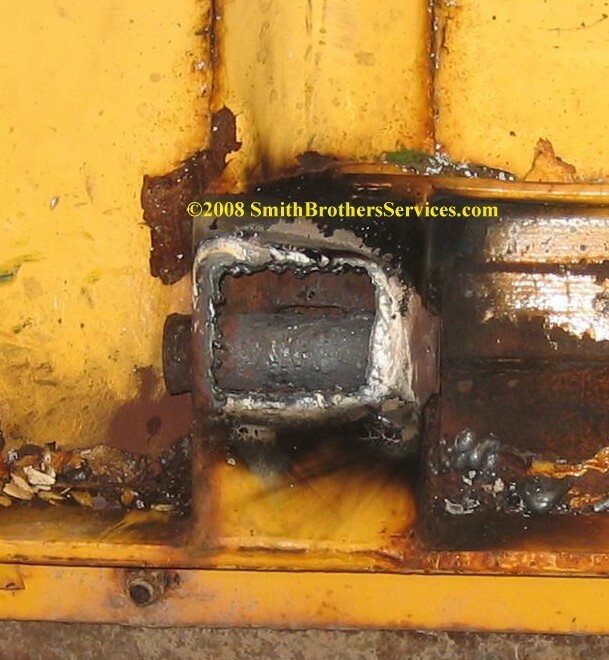 Look at the corrosion piled up in the cavity. No way was this apart recently. Putting it back together. 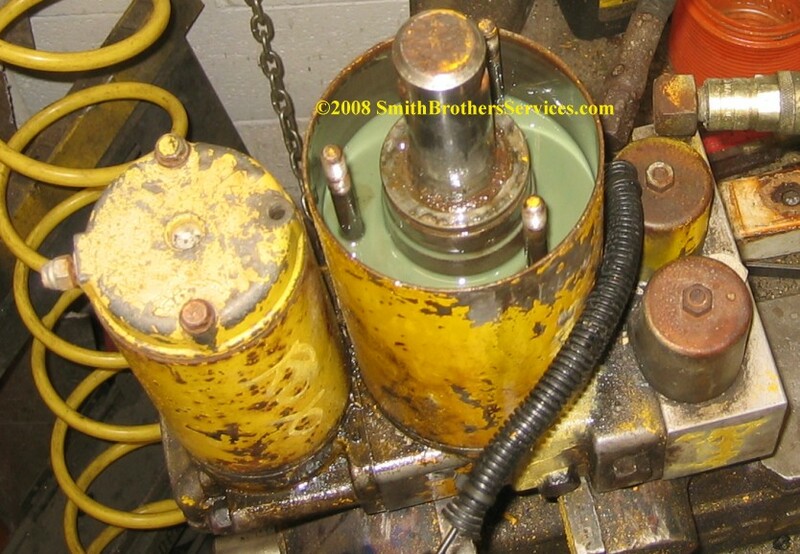 Used Lift Cylinder installed. 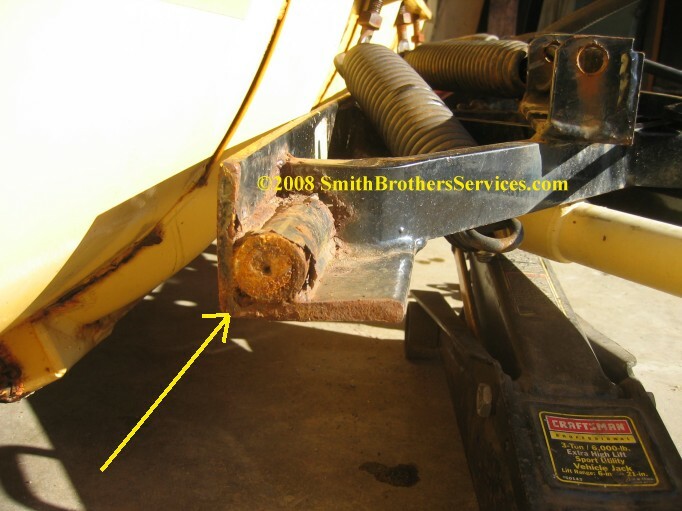 No more rust! Putting it back together.